This year, it’s ten years ago, that we started with the process to create the worldwide movement of the „world women“. That means all the women who work together in the process of the world women’s conference of grassroots women. Congratulations to all of you for this grand success! What was the situation when the idea arose? After the breakdown of the former Soviet Union the world situation has changed. The strongest of the capitalist and imperialist super-forces – USA and Europe – conquered the whole world. The well-known face of colonialism changed into neocolonialism. The so called globalization in reality was a capitalist and imperialist new organization of the international capitalist production. Their new world order submitted the whole world under their power. Their instruments are the manipulating mass media as well as their military. Some hundreds of monopolists are now ruling the whole world. 2006 was 10 years after the Beijing UN women’s conference, the last of four conferences for women. From now on the UN concentrated on crisis management all around the world. In monitoring the Bejing conference we could see: In spite of all resolutions, lobbying, mountains of papers, empowering programs of governments, the World Bank, the IMF – the situation of the grassroots women became even worse! They were the victims of globalization, of neoliberalism, of the privatization of social benefits and their double exploitation and oppression increased. We then saw, that their „empowerment of women“ was meant to empower them to play their role in the new world order of imperialism. On the other hand – the internationalization of economy and politics let the world get closer together. The workers of the large monopolistic factories learned to fight not against one another, but to struggle together. More and more women all around the world realized, that the roots of our problems lay in this system of exploitation of mankind and nature and in the patriarchal mode of thinking that it has shaped it over hundreds and thousands of years. So we as grassroots women have had to broaden our horizons. Violence against women was increasing. More and more women became employed – but the wages are much lower than those of men, which are already wages that are based on exploitation! The natural living conditions are being destroyed more and more! The social and reproductive rights were diminished! The knowledge of the rural women how to produce and give food to our children was violated by monopolists like Monsanto, Nestle and others! But on the other hand the consciousness about the women’s question is growing. We can see very important movements in which women are in the front line: we learn from the hard struggles of the young, female garment workers in Bangladesh! 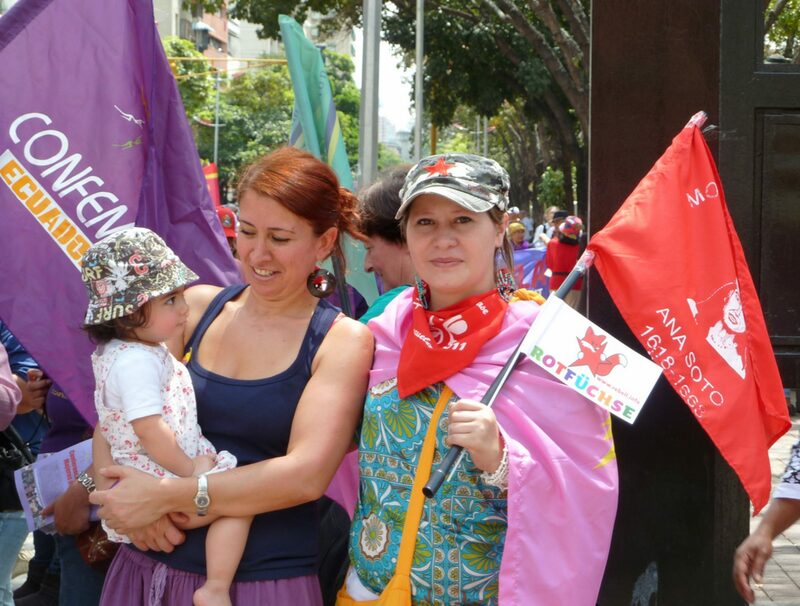 We learn from the tough and well organized struggles of the cleaning women and care workers in the Netherlands and the educators in Germany. We hear about the meetings of the women in Argentine with tens of thousands of women every year. We evaluated the experiences of the so called Arabic spring! And: we are excited about the hard and successful struggle of the Kurdish movement, and especially the women, against ISIS/ Daesh, their victory in Kobane and their message to the women of the world: the liberation of women is closely connected with the fight for liberated societies! All this is the background of creating the movement of the World Women’s Conference of grassroots women. During an international women’s political council in Germany in 2006 we started to discuss this idea with our friends and sisters in our countries and through the internet. We found more and more supporters. Women from Venezuela applied for the first World Women’s Conference in Caracas/ Venezuela. So exactly 100 years after celebrating the first International Women’s day we celebrated the first World Women’s Conference of grassroots women. We discussed and decided the principles with women from more and more countries: We work above party lines! We work and decide in a democratic way! We do not separate ourselves from other movements like sometimes the feminist movement does. As an independent women’s movement we closely work together with the working class movement, the unions, the environmental, youth, peasants’ and all liberation movements. We want to be financially independent! We request money from the governments – but we also create our own financial basis, relying on the masses. We learn to work and think in an internationalist mode of thinking. We practice a democratic culture of debate. Of course – also during this conference – there will be mistakes, misunderstandings and problems. But in this case we speak frankly! We discuss in solidarity! And last but not least: these conferences only should be the highlights of a cooperation in which work ever closer together. We don’t just want to have wonderful conferences and no changes in our lives and our struggles and our countries. The most important criterion in the conferences is if they really strengthen the women’s movement in all countries! If they really create a sustainable coordination in information, cooperation, fighting together and mutual support. Now we are successful in the preparation of this conference. This process really was a process of overcoming large problems. In spite of the earthquake we are here! In spite of the unofficial blockade by the Indian Government against the sovereignty of the Nepalese people we are here! In spite of all contradictions in the party landscape the United Women’s Association became stronger and stronger! The brigadists from Europe and India together with the volunteers from Nepal got together and did a great job! It spite of all problems of money, of language and of different attitudes there are already representatives from 38 countries and participants from 48 countries here ! All this is much more than the preparation of a World Women’s Conference. This is to learn to come together, learn from each other and start to create an international liberation of women which is organized and fought for. And to create a liberated new world! Forward with the international women’s movement! Let’s make the second WWC of grassroots women a grand success! Women will climb the highest mountains!